It’s never too late to wish Subho Bijoya, as the hangover of the grand festival is still there in our mind. In fact it flows in our mind throughout the year. Pre puja the feeling is like “Pujo Ascche” and post puja we shout in joy “Ascche Bocchor Abar Hobey”. The hangover continues all the time. During Puja I was in Mumbai for some work. As obvious I missed Kolkata badly each and every moment. The milieu of Kolkata dresses up in divinity and royalty. This striking look of Tilottama is very close to my heart which I missed very much. The city brightens up with some eye catching lightings that add extra pomp. The pandals also look mind blowing with the touch of lighting. Kolkata is renowned for Durga Puja and Adda. When the puja bells are ringing around everywhere then it cannot happen that Adda won’t be there. Puja and adda are inseparable. This is the thing I enjoy mostly in puja. Whenever I stay in Kolkata during puja I enjoy late night adda and fun with my friends. Every puja I wait for the bhog eagerly no matter how late it is. Enjoyment with spirituality that is what puja means to me. Though I had a hectic schedule in puja but I managed to attend my baba Biswajit Chatterjee’s puja there. It was like family get together. I was enjoying puja fullest there with everyone but still I was missing Kolkata as it has its own charm during pujas. Not only Durga Puja I missed Lakshmi Puja too. Kojagori Purnima is always special because of the delicious prasads. 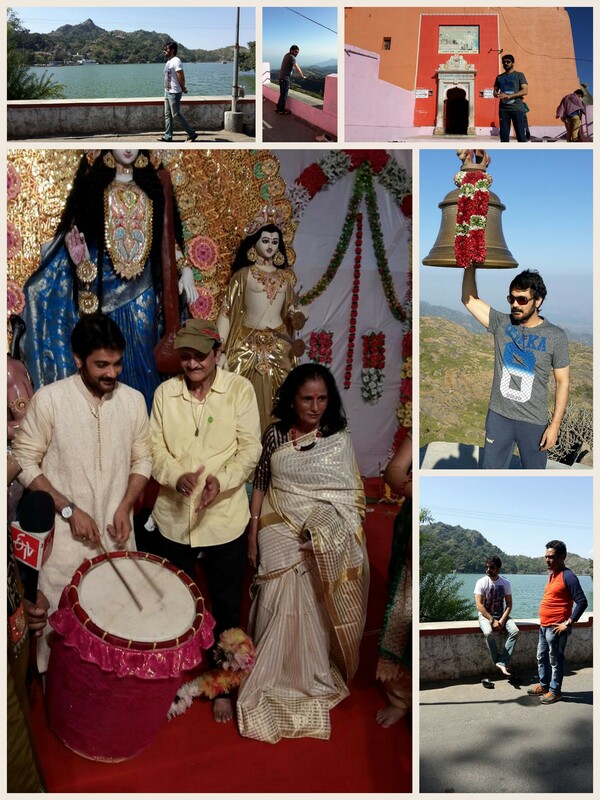 I am now in Mount Abu for the shooting of my next Hindi film directed by Ankush Bhatt. Shooting schedule is very tight but whenever I get some free time I just go for walk to enjoy the scenic beauty. The beauty of Mount Abu is beyond everything. The chilled weather and the calm serenity of the mountains are so pure, so natural that it feels like heaven. As they say, sometimes silence is better than words as it helps one to find oneself in a better way. I am enjoying the food here very much. Food becomes tastier when it is shared with friend especially with new friends as it binds everyone in one string. It is always fun to work with new people. I love to work with new people as I get to learn a lot new things. Ankush Bhatt is one of the finest directors. Just loved the way he brought out the character in the story. I am really excited for this project. As of now few more scenes left, to be shoot in Mount Abu. Really enjoying the shooting here. I will be back within few days. See you soon. Take Care. Autumn is here with the cotton clouds floating across an azure sky and I already feel the sudden rush of euphoria down my spine. Durga Puja is our grandest festival and it is at our doorstep now. The shiuli trees are overflowing with fragrant whiteness, mother nature already knows the Goddess is on her way to her father’s house. Yesterday,on the auspicious day of Mahalaya, the beginning of Debipakkha. My day started by tuning in to my radio to listen to the reverberating voice of Birendra Krishna Bhadra. The Agomoni melodies wiped away all my weariness and I was endowed with divine energy to start a new day afresh. This year, Mahalaya came with lots of new beginning. The day before Mahalaya, was the first press meet of BCL. I’m always super enthusiastic about Cricket & football. Cricket is a game which never fails to thrill you till the last over. At any moment all the calculations can take a different turn. Be it World Cup, test match, one day series, T-20; I always find this game worth watching. To talk about the players of BCL teams, you always watch them on silver screen and in here you will be watching them on field running between the wickets, bowling and batting! In each team, there will be actors and technicians who will be performing. 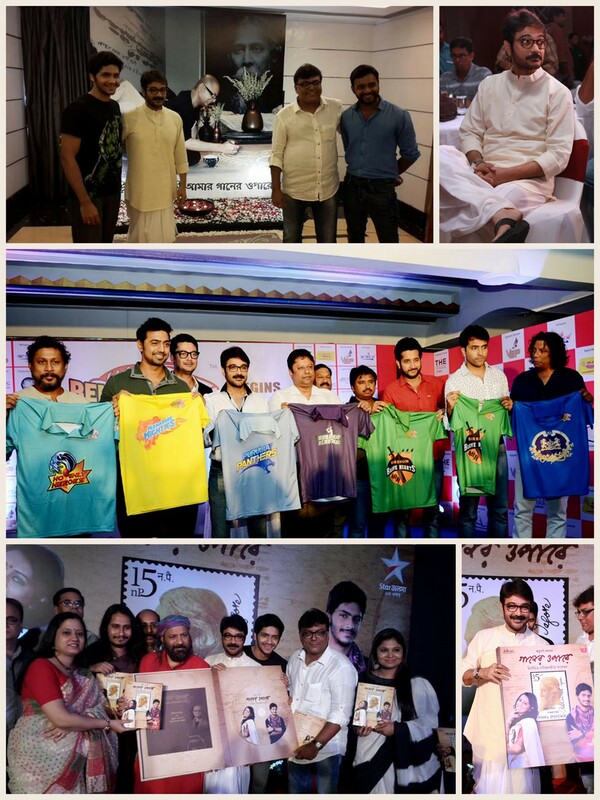 I think, it is a great initiative as our whole Bengali film industry will come under one roof through this game. It is a small industry, and one thing that is the most important to flourish from all aspects is the unity between people. And what could be more effective than the friendly matches between the teams to ensure that? But yes, they are preparing themselves to give tough fight to each other. All the players are concentrating more on fitness and and busy preparing for their first match! I’m looking forward to witness how they compete against each other. Every year while listening to Mahalaya, I become nostalgic. The dawn comes with handful of memories of my childhood, few places, and few people. A different kind of melancholy engulfs me. Yesterday’s Mahalaya was really special for me. As It was Gaaner Opare music launch yesterday. No point for guessing whom I was missing so badly. It was a dream project for me and Ritu. I am glad that we did Gaaner Opare.It is amazing to note that years after it went off air, people still talk about Gaaner Opare. Pupe, Gora, Prodipto established their names in the hearts of people. There lies our pride. The Rabindra Sangeet that had been used in the serial got huge appreciation. What I realize, the creations of Rabindranath Tagore are for every aspect, every single occasion of our lives. And many people told me they have rediscovered Robi Thakur through that serial, through the songs. What could be a greater tribute to Rabi Thakur? Ritu would have been very happy today. And finally, the king of football, the legend who won 3 world cups for Brazil visited Kolkata yesterday after 38 years and it is an honour for me to share the stage with him. It was a delight to interact and watch the man closely who was listed for Guinness World Record for scoring the most number of goals. The football enthusiasm and madness of this city was so compelling that this star couldn’t resist to pay a visit to nowhere in India but here. Is there any Bengali sports lover who doesn’t like to play football? Mishuk always challenges me in this game and I have always managed to remain consistent in losing the game with him. Haha! But it feels good to see the joy in his face. Just like Bengali’s love for football I definitely believe that they will respond with equal enthusiasm to this new venture with cricket. Yes it was hectic. But I really enjoyed the moments spent. And I love to share all these good moments with you all! Love you all and stay blessed! Why do we celebrate birthdays? We grow one year old, one year deducted from our lifetime! But dear, you lived one year; smiled, laughed, cried, failed, won, lost! You spent another year in this beautiful earth, you saw the people you love, spent time with them. Enough reason to celebrate! Isn’t it? 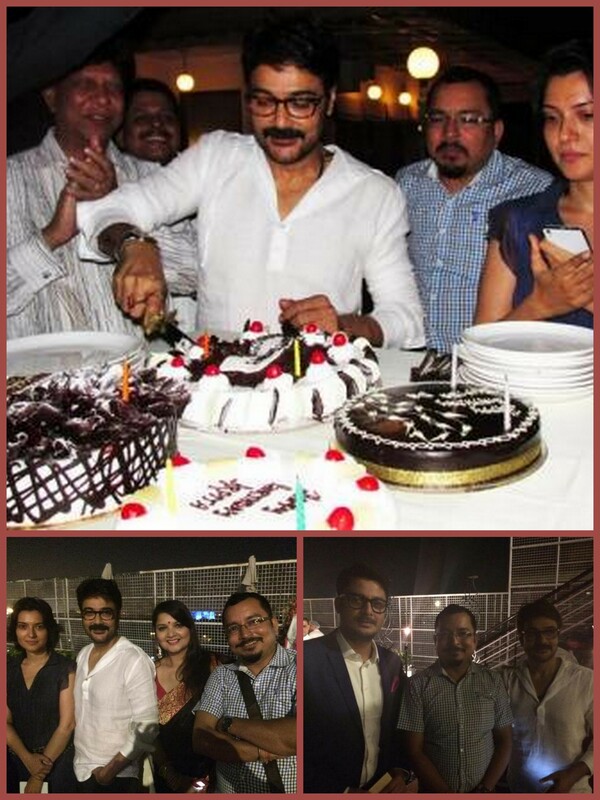 It was the closing ceremony of Prosenjit Chatterjee Retrospective at New Delhi the day before my birthday. And I was present there to be a part of that elaborate function. From there started the celebration. Surprises after surprises and it went on throughout the day. They did not leave any stone unturned to make me feel special. I don’t have words to express the joy! The joy got multiplied when my office people gave me a lovely surprise. After which, I visited Anondoghor. They welcomed me with loud cheer. What a great sight it was to see the little kids smiling and giggling! Who can tell they all have a void in their lives which probably can never be fulfilled. It is an orphanage where most of them did not see their parents or lost them in a very early age. Few are suffering from HIV and other deadly diseases. Few are there who have grown in age but not in mind. But one thing was common between them. They smiled, they were happy to see me there. They came to me, tried to express their joy and excitement. So much love in their heart. Such Simplicity! Such innocence! I was so touched! What else could I ask for? It is unfortunate from my part that I cannot meet them very often due to my busy schedule. But I make it a point to be there,on my birthday every year. Next destination was the set of Zee Bangla Originals’ next movie. There they organized a cake cutting ceremony. Spent time with our young protagonists. Such young talents, always up for a challenge. This thing I really like in this generation. They don’t fear anything. They are more clear-headed than what we used to be in that time! Following with the members of my fan club. They are the part of my life now. And then, it was the turn of my 2nd family. Jisshu, Jeet, Soham, Koel,Abir, Tota. Rahul, Apu, Priyanka, Pallavi and all. I could see the entire tollywood industry were there. Celebrating with me, thank you all for the love you have for me.Every year they never fails to surprise me. Gifts, cards, bouquet and over all the immense love and respect I kept receiving throughout my birthday day! I’m overwhelmed! Its never too late to thank people for making my day so special. Thank you all! You people made me what I’m today. Keep loving me, keep blessing me. Stay well! It was the closing day of the Retrospective. An evening so rewarding and promising. Paying homage to Prosenjit Chatterjee, that was more than flattering. I would rather look at this as an initiative to promote Bengal Cinema nationally and project a glorious prospect for it in the nearby future. And this event had been a grand success at that. The event screened eight movies ‘Dosar’ ,‘Khela’, ‘Autograph’, ‘Shanghai’, ‘Aparajita Tumi’ Jaatishwar”, “Ami, Yasin aar Amar Modhubala” and “Moner Manush”. These films are more than just films I starred in, but movies that introduce the audience to the works of eminent directors like Gautam Ghose, Rituparno Ghosh, Srijit Mukherji and many more. Movies that speak of the flourishing industry that Bengal cinema is, that tells the story how it has evolved through the years after being left by the triad of stalwarts –Satyajit Ray, Mrinal Sen, Ritwik Ghatak. The closing ceremony was held at the India Habitat Center, New Delhi on 29th September, 2015.The guests of honor were Goutam Ghose, a brilliant director and friend as well, Mahesh Bhatt, one of the big bosses of Bollywood, and Jawhar Sircar, the CEO of Prasar Bharati and also my dear elder brother.Conversing with Mahesh Bhatt and sharing our views on the future of regional cinema was nourishing and soul-enriching. 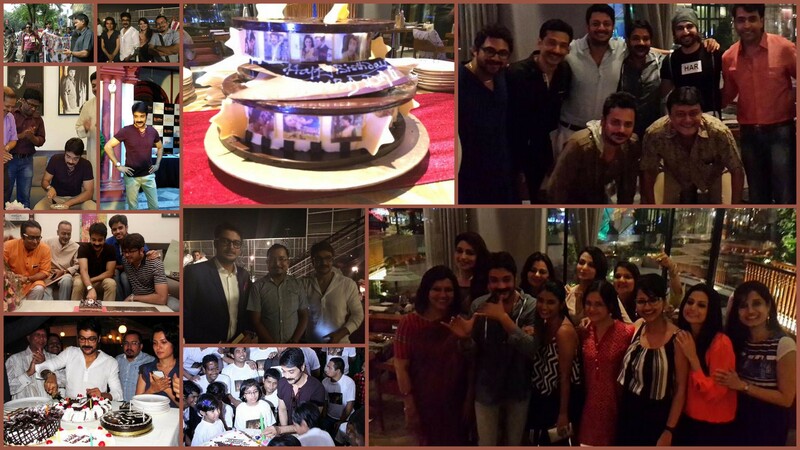 Jisshu Sengupta, Arpita Chatterjee and Taslima Nasrin were among the few special guests worth mentioning. Ms. Nasrin never fails to amaze me. I feel humbled in front of such a spirited woman, who is more of an inspiration to me than a great writer on absconding. I am very grateful to CII for organizing such a gala event dedicated to Bengali cinema. We would be indebted to IHC and Senco too for sponsoring such a grand enterprise. Our industry is in need of such affluent patrons. All of us presented there took a solemn oath towards the betterment of Bengali cinema in terms of productivity, propaganda as well as increasing its intellectual value. I met the people of Bengal association towards these purpose and that was both constructive and decisive.And last but not the least, my team arranged a surprise birthday party for me as if they haven’t done more than enough to make me feel special. It is very thrifty on my part to just dedicate another paragraph for it. I owe you big time guys! Love you to the core.